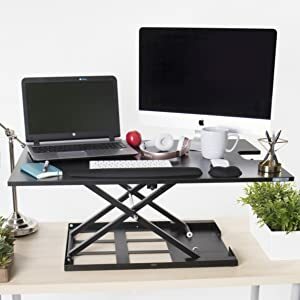 Have you been eyeing a sit to stand desk converter for your health and to relieve back pain, but you need lots of room to work? We have your solution – the innovative X-Elite Pro XL 36” Sit / Stand desk by Stand Steady. 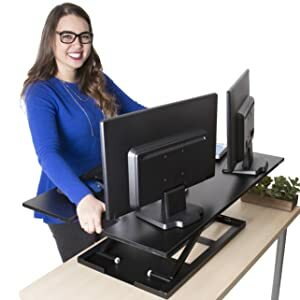 The X-Elite Pro XL 36” sit stand workstation requires no assembly and fits right on top of your existing desk, letting you easily transition from sitting to standing! Just open the box, set it on your desk, and BOOM! - now you are standing ergonomic! CONVERTS EASILY FROM SIT TO STAND: The X-Elite Pro XL 36” is a height adjustable standing desk converter. It simply and quickly raises and lowers with with our premium pump assisted lift. EXTRA LARGE SURFACE: Built wider than most adjustable desk risers, you'll have plenty of space for your dual monitors (and a laptop), keyboard, and accessories! ERGONOMIC HEIGHT RANGE: Choose the most comfortable standing height for you, up to 16 inches above the desktop! ARRIVES FULLY ASSEMBLED: Simply open the box, place your computer, mouse, and keyboard on top of the X-Elite Pro XL, and start standing! AWARD-WINNING MODERN DESIGN: Buy an X-Elite Pro XL 36” today to enjoy the health and productivity benefits of sitting less and standing more! Fits on your existing desk and arrives fully assembled! Simply open the box, place your new X-Elite XL by Stand Steady on your desk, use the ergonomic handle to pull the desk up into standing position and you are ready to get to work! With this extra wide standing desk, you will have space for two monitors, a keyboard, mouse, phone, to-do list, and so much more! Perfect for spreading out, plus now you can stop reading all of those blog articles about how to make the most of your office space, here you go! By an award-winning industry leader in standing desks and ergonomic office furniture, the X-Elite Pro XL is design from sturdy and reliable materials. High quality materials and modern design, make this sit stand desk the ultimate choice for your perfect standing desk converter. Extra large working surface fits everything you need and more! Raise and lower with easy air-assisted lift. Ergonomic handle makes moving from sitting to standing easy as 1,2,3! Sleek, modern design fits into your decor, X-Elite XL blends into any office set-up. Compact footprint with large desktop - fits on a smaller underdesk but you still get maximum desktop surface! 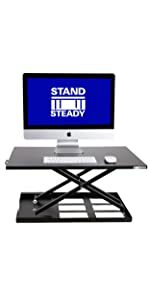 Get the best bang for your buck with the X-Elite Pro XL Standing Desk by Stand Steady! Love it - Great standing desk! But we didn't see instructions to remove the shipping safety screw that holds the desk together during shipping and you need to remove that first and then it all just unfolds and is very east to set up. I love the functionality and the room provided. There is room for my iMac, small light, and space to work and write. I have a slight disappointment on the weight capacity of 20 lbs. Apparently my iMac 27" is 21 lbs and so the 20 lb weight limit makes the apparatus a little difficult to raise and lower. This should be addressed with a slightly beefier hydraulic piston. The additional space provided is a primary reason I purchased this standing desk over the other brands, that and cost. I did not realize there was a low weight limit until after and had no idea the iMac was 21 lbs. All in all though, I am satisfied and have the strength to coax it into the raised position. The desk is easy to raise and lower. I love how I have space for a laptop, a large monitor, a keyboard and a mouse -- and still have space leftover for my phone and other minor things. The height is perfect for me (I'm 6'-5"). It's a common misconception that if you have a lot of stuff, you can't use a standing desk. Let the X-Elite Pro XL debunk that myth! Effortlessly raise and lower your multiple monitors, papers, coffee mugs, and more with pump lift assist! Why the X-Elite Pro XL? You've been wanting to get a sit to stand desk because it is good for your health and relieves back pain, but you aren't sure which one to invest in. 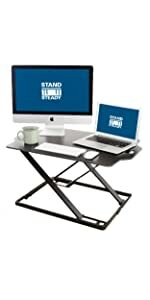 We have your solution – the innovative X-Elite Pro XL Sit / Stand desk by Stand Steady. 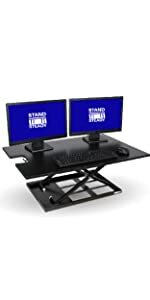 The X-Elite Pro XL sit stand workstation fits on top of your existing desk, arrives fully assembled, and easily transitions from sitting to standing. Just open the box, put it on your desk, and boom - you are now standing! The X-ELITE SERIES is from Award-Winning Stand Steady® standing desks, an innovative leader in workstation ergonomics, which has been profiled in the Washington Post, France2 TV, and Apartment Therapy and more. 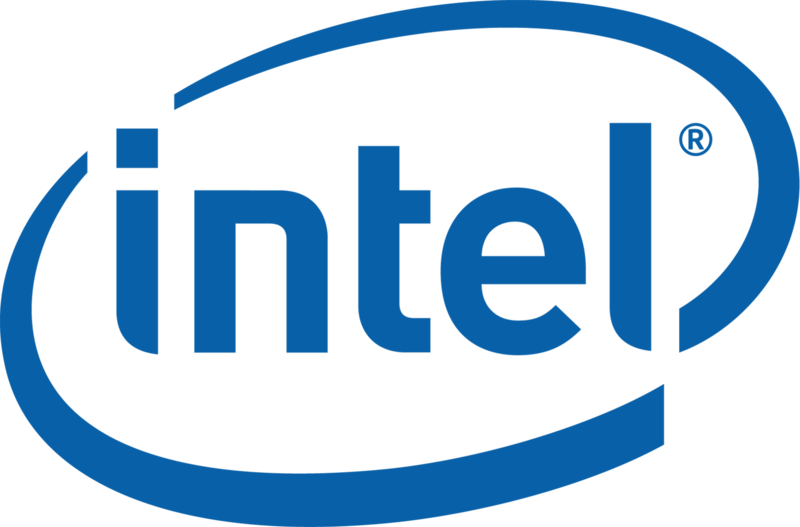 Clients include Fortune 500 Companies, the World Bank, prestigious universities, law firms, leading institutions in the medical and healthcare industries. These extra details set the X-Elite Pro XL apart from other sit stand desk converters! The X-Elite Pro XL offers the ease of our bestselling X-Elite Pro sit stand desk converter, but with almost double the square footage! 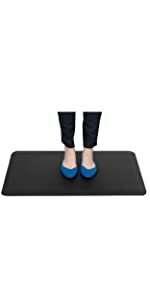 Elevates from a low sitting height of 2.5” to a standing height of 7" - 16” - Customizable for YOUR HEIGHT! 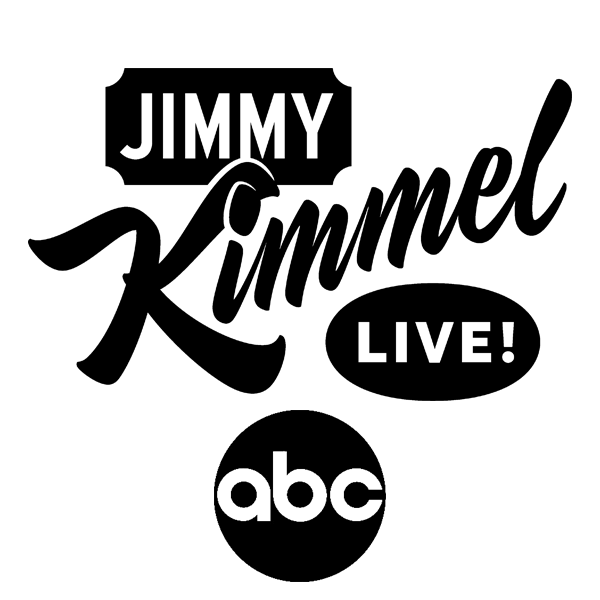 "I found that this product was bigger and cost less than competition. Well, after only a week I can tell you that this will make a big difference in my life. My whole body is feeling better and I'm able to get more work done since I don't have to take breaks to stretch my legs. Thank you!!" "My organization of 15 people now has 4 Stand Steady desks! The feature I immediately appreciated was that there is no assembly required, so it can just slide out of the box. We have also loved that shipping is so prompt." "Life-changing! The coolest injection of energy into my days at work now, lots of interaction with my staff...since I'm already up, why not walk over and talk to them in person instead of emailing and messaging? Truly changed the dynamics and relationship within our our office, not to mention the health side effects. No more back/neck pain at the end of the day, and of course, burning more calories throughout the day certainly is a fantastic benefit!" 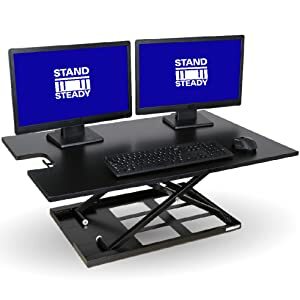 Have you been eyeing a sit to stand desk converter for your health and to relieve back pain, but you need lots of room to work? We have your solution – the innovative X-Elite Pro XL 36” Sit / Stand desk by Stand Steady.